I worked for Vidal Sassoon for 10 years before venturing out on my own. During that time I worked my way up from a shampoo assistant through to senior manager of the U.S. salons. The experience paved the way for me to understand the salon industry as a whole and not simply through the eyes of a stylist. I was fortunate to be able to work with Vidal Sassoon himself during many of my years there as he was still in charge of the salons. It was a true gift. 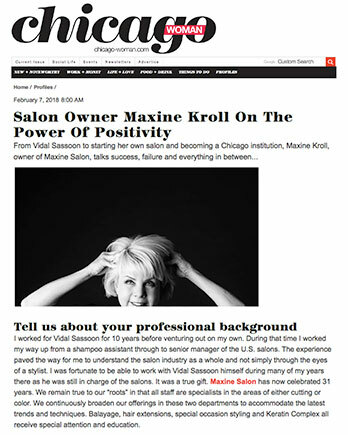 Maxine Salon has now celebrated 31 years. We remain true to our “roots” in that all staff are specialists in the areas of either cutting or color. We continuously broaden our offerings in these two departments to accommodate the latest trends and techniques. Balayage, hair extensions, special occasion styling and Keratin Complex all receive special attention and education. The people! To be a part of people’s lives through so many years is quite the honor. From a staff perspective, I have witnessed my team grow their careers and personal lives while calling Maxine Salon their home. Many of my staff members have been with me for upwards or 20 years, and some even up to 30. From a client perspective, I have shared in the lives of my clients through as many as four generations. I am so proud to know all of these families. Such loyalty! Relationships are what I love most about what I do. It is through our relationships that we find ways to advance our business and our brand. This January, we launched a new relationship with renowned hair care brand Shu Uemura, and we couldn’t be more excited to move forward with them as our partner. Can you share an experience when you learned the importance of women supporting other women? I once worked for a company that shared ownership three ways. The two men had 45% equity each and the woman had 10%. She ran the business, was its heart and soul, and worked harder than anyone ever knew - and did all for the sake of doing it right. Yet, her purpose was reduced to siding with one of the men should there be a conflict of interest between them. I vowed then that I would never bow to the mentality that men were superior. We are all to be treated fairly and equally and I have kept this promise through all these years of business. Today, Maxine Salon is a female run organization where all of our stylists and clients are treated equally. The best way to support women is to not support organizations that treat them unfairly. Two years into the birth of my salon, I lost a founding stylist and three years after that, a founding colorist. At that time we were a company of five. The hit was tremendous. I worked as many hours as I could. I taught the next generation of stylists. I prayed. I persevered. And it paid off, as we are now a company of 50. What's something that our readers may be surprised to learn about you? I started in the beauty industry doing hair as a hobby to pay for my college tuition. I was initially focused on becoming a pharmacist. Thank God I didn’t stick to that plan! I would have had bad hair, and spent my time talking to medicine bottles. What drives you to success? Failure. Specifically, failure the second time around. The first time it is a lesson. The second time is a missed opportunity to have learned from the first round. What's your favorite thing about Chicago? I love the Midwestern values of our town. It makes for a great staff and client base that is the fabric of my salon. I also love our proximity to the lake. I am a Sagittarius and have an affinity for water. Name three women you are inspired by and why. 1. Katharine Hepburn. Fiercely independent. Breaking through stereotypes. She made pants fashionable for women way before its time. 2. Amelia Earhart. How brave she must have been to fly solo. Guts are always better than glory, no matter the outcome. We are still talking about her all these years later. 3. Working mothers. I stand in awe everyday knowing what my team can accomplish. Not only at work, but also managing a home and family. Mind-blowing! What's the best advice you've ever heard? Never, ever let someone else’s negativity become yours. I was a young stylist and one of my very successful business clients gave me that bit of information after I was complaining about my management to him. I stopped complaining after that and worked on becoming my own person. Burden lifted.